ECC, LLC is a North Carolina manufacturer of hollow and solid plastic balls used by industry and public works for a variety of purposes. One recent deployment took place in Raleigh, North Carolina’s EM Johnson Water Treatment Plant. The City is using these black hollow floating balls to keep sunlight from evaporating water from the reservoir there. These shade balls, as they are also known, block sunlight from penetrating the water. That has a secondary benefit of reducing the amount of chemicals they need to keep algae from growing. 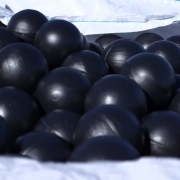 Recently the City of Raleigh produced a video to showcase the new method, which used the floating balls made right here in North Carolina by ECC, LLC.